DENMARK - Danish pork exports for the first six months of 2015 continued to show modest growth, with levels totalling 555,000 tonnes. The signs of growth which were recorded in the first quarter of 2015 mean that the total figure for the half year was up by 1% on the same time period in 2014. Despite this rise, the total value fell by 9% to DKK8.4 billion (€1.1 billion). 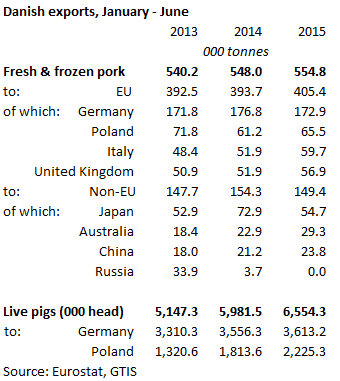 The EU remains the primary market for Danish pork, with exports increasing 3% on the corresponding time frame in 2014. The rise in sales to Poland, Italy and the UK, by 7%, 15% and 10% respectively, was enough to offset the 2% decline to Germany. Exports to non-EU markets decreased by 3%, with Japan remaining as the largest such market, despite a reduction of 25%. This drop in exports to Japan is partly a result of the country’s domestic production recovering from outbreaks of PEDv in 2014. Australia continued to be a major growth market, with purchases for the first half of 2015 more than a quarter up on 2014. The majority of this growth was recorded in the first quarter, with exports increasing at a slower rate in the second quarter of the year. Unlike some other EU exporters, growth in shipments to China was a modest 12%. Following recent trends, Danish live pig exports have continued to grow, reaching over 6.5 million head for the first half of 2015. Sales increased by 10% as farmers choose to sell more of their weaners to be finished at a cheaper cost in other countries. In total, 1% more pigs were shipped to Germany, while Polish purchases rose by a further 27%, maintaining its position as the main growth market.